Think You Know Your Whisky? Aberlour Takes A Closer Look! A world-first series of super-macro images of whisky unveils the enigma behind the expert craft and natural beauty of the premium single malt, Aberlour. Aberlour commissioned David Maitland, one of the world’s foremost nature photographers, to chart the journey of the whiskys creation taking in microscopic views of the rock, water and wood used in the whisky-making process. Subjects include the granite mountain from where the distillery takes its spring water, the oak staves from specially selected casks in which the whisky is matured, and finally uncovering never-before-seen glimpses of the single malt itself. The photography uses a variety of techniques to capture some of the natural elements that contribute to the unique flavour of this single malt Scotch, from a glimpse inside each grain of barley to the actual rings from an oak cask and the crystalline structure of the final spirit itself. The positioning of the distillery at the foot of Ben Rinnes, and surrounded by the natural water springs, plays a vital part in the creation of each bottle of single malt, as do the casks in which the whisky is aged. Davids photos have shown beyond the glass and cask and allowed us an insight into the natural elements and distillers craft which are vital to the creation of this enigmatic single malt. Ballantines Puts A Smile On Your T-Shirt! Ballantines has unveiled tshirtOS 2.0 – the worlds first scrunchable and washable digital t-shirt which allows wearers to display text of their choice and animation in real time. The un-veiling took place during Pernod Ricard’s “Innovation Day” event in Paris. Representing one of the most advanced pieces of apparel-focused wearable technology available today, tshirtOS 2.0 is an illuminated blank canvas – an innovative approach to using technology for the purpose of self-expression and to show the world the ‘True You’, abiding by the Ballantine’s mantra of ‘Stay True’. It is controlled by a mobile app. 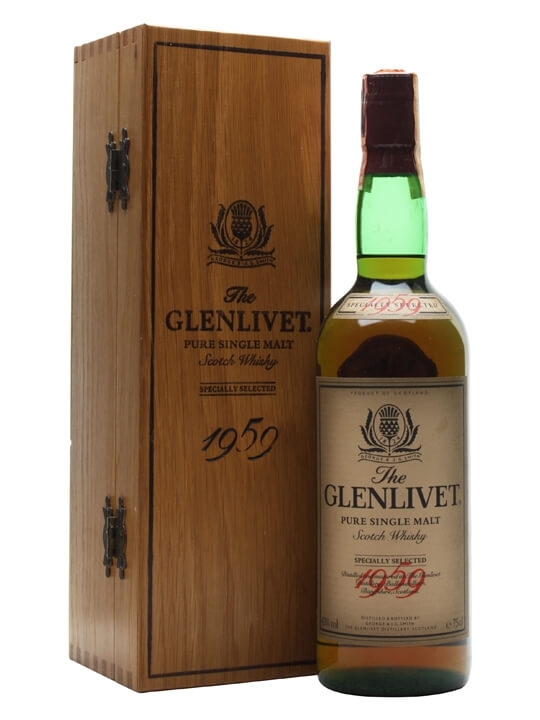 70cl / 43% / Distillery Bottling – A very old and rare 1980s bottling of Glenlivet 1959. Not to be confused with the Cellar Collection edition of which this vintage bottling was a forerunner.